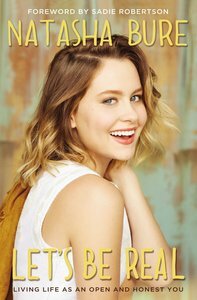 From singer and social media celebrity Natasha Bure, the daughter of Candace Cameron Bure, comes a real, honest conversational book that doesn't hold back. Everywhere she goes and every video she posts has one basic message: this is real, this is life, and we all go through it. Whether it's acne, boyfriends, faith, stress, or having fun, Natasha's view is to simply be honest, simply be real, no matter what you face. Natasha's real and relatable tone paired with personal notes and stories will help readers see that living a "real" life is the best life. The dust jacket features embossing.